Ammunition Capacity: 18-19 round full size drop out metal magazine. 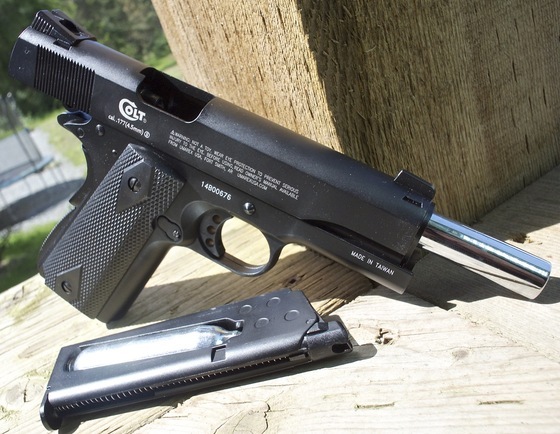 Trigger Pull: The trigger pull on the Umarex Colt Commander CO2 Blowback 4.5mm BB Pistol is exactly what you would expect from a true single action 1911 styled pistol. It has a short take up and then a nice light and crisp pull and release. Because of the similar mechanics not only to the trigger but other aspects of this gun, it would make a truly awesome low cost trainer to be used when your real 1911 is not practical and also to save on the high cost of real 45 semi auto shells. Accuracy: I shot the Umarex Colt Commander BB gun at a target from 30 feet away in a semi rested position, and it performed well getting an 8 shot 1.5 inch grouping very close to the bulls-eye that extended a little larger with three additional rounds that came outside the smaller 8 shot grouping. The sights are non-adjustable even thought they kind of look like they are so it was nice to see that this BB pistol was already dialed in pretty good! My initial Chrony testing puts this gun right in the 300-325 fps range getting a 5 shot average of 306 fps which is just fine for this style of heavy full realistic blowback action BB shooter. The outside temperature was 22 Celsius (72 Fahrenheit) so the Colt Commander should shoot a bit quicker on a warmer day. You can expect to get three good magazines worth of shots with some extra CO2 left over for a potential 4th magazine. If you slow your shooting down and let the gun and CO2 warm up between magazines you can get 4 magazines with this BB gun for sure. 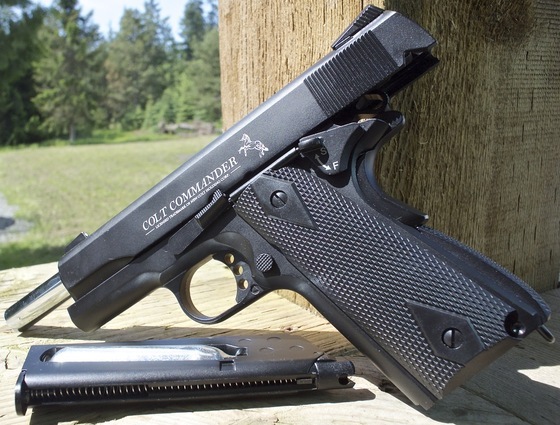 Build Quality: Like the other KWC 1911's, the Umarex Colt Commander version is overall a well built and mechanically sound BB pistol. 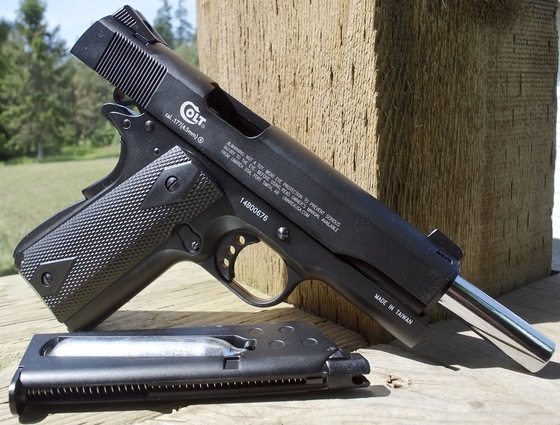 Tolerances are good and the finish may even be a bit better than what KWC makes for its own non-licensed versions of this very popular 1911 series. Realism: The Umarex Colt Commander CO2 Blowback 4.5mm BB Pistol is as close as you can get to a real steel 1911 styled 45 semi auto but with a slight modern Tactical look to it, the Colt Commander version has the addition of a: Tac style trigger and hammer, and upgraded white dot sights. This gun is nearly all metal with a very heavy blowback action that simulates the more sluggish and delayed blowback of a real steel 1911. And the true 1911 single action trigger will not disappoint you either. All metal construction - Good weight and solid feeling gun. Nice heavy blowback action that replicates a 1911 very well. Very Accurate 1911 replica in terms of looks and mechanical aspects. True 1911 single action trigger, excellent pull, very smooth and light. Working safety and grip safety. Decent accuracy, not too bad amount off shots for this style of gun about 3+ good magazines. All metal full size dropout magazine that holds the BB's and CO2. Chrome coated barrel and breach not only look really nice but wear better. Sacrifice fps and shots per CO2 because of the heavy blowback but worth it. Not a big fan of the white "S & F" on the safety or the white warning instructions on the slide. 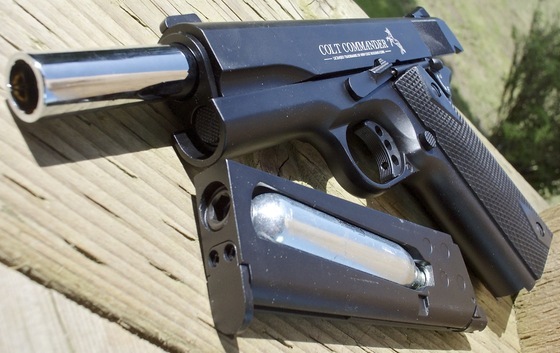 Sure the Umarex Colt Commander CO2 Blowback 4.5mm BB Pistol is yet another KWC made 1911 but Umarex has really captured the classic 1911 style without taking it too far into the Tactical realm. The addition of the modernized white dot sights, along with the machined trigger and hammer and the chrome barrel and breach give this BB shooting blowback 1911 a well balanced look. 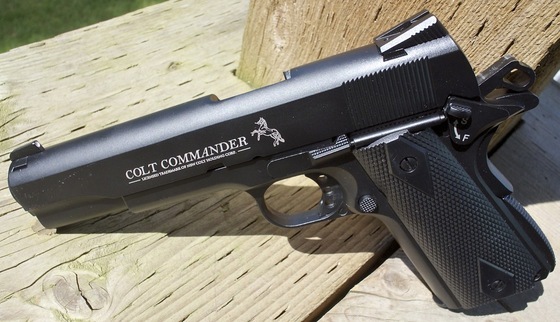 If you're looking for a traditional 1911 A1 but with just a few modernized tweaks, then check out the Umarex Colt Commander.